Originally published on Idea Lab. An avalanche of analysis, impassioned commentary, and angry rants descended upon the tech mediapshere over the two past weeks ever since One Laptop Per Child Chairman Nicholas Negroponte urged developers for the XO laptop (formerly the ‘$100 laptop’) to recreate the student computer's user interface for Windows XP rather than Linux. That decision led to the defection of Walter Bender who had been OLPC's president of software and content and a longtime colleague of Negroponte. It also led free software guru Richard Stallman, who ironically switched to a XO laptop himself just before the announcement, to ask out loud, “Can we rescue OLPC from Windows?” Like Stallman, many other free software advocates argue that one of the principal goals of the One Laptop Per Child Project was to free students from proprietary software, which they are not able to alter to suit their own needs. But Ivan Krstić, formerly OLPC's director of security architecture, says that the OLPC project has always been about education first and technology second. What has been missing from all sides of the debate so far is that, no matter if the XO user interface runs on Windows XP or Linux, it is still currently missing many applications to help students learn and participate in the classroom. In hope of getting local Uruguayan programmers to develop educational applications for the XO laptop, Rising Voices grantee Pablo Flores of the Ceibal Project, is organizing a programming “jam” this weekend in order to introduce local programmers and get them thinking about developing innovative applications that particularly suit the needs of the hundreds of thousands of Uruguayan students who now carry their bright green laptops to school each day. What follows is a translation of Flores’ original announcement in Spanish. The time has arrived to make some new applications for XO laptops. Uruguay is in a privileged position, since our high density of XO laptops gives us a large user base who can use our software. To put it another way, Uruguayan programmers have the double benefit of being able to both provide practical solutions to meet the educational (and other) needs of our country and, at the same time, distribute their applications to the entire world. 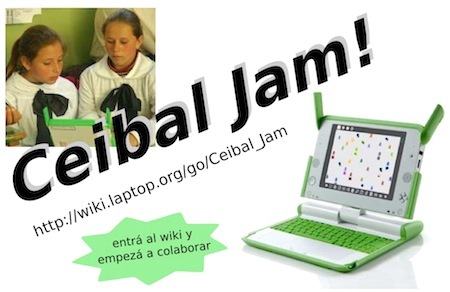 To facilitate the exchange, with the support of LATU and the Faculty of Engineering, a gathering called Ceibal Jam! is being organized this weekend for developers interested in programming applications for the XO. Information is constantly being updated on the wiki, where you can register and participate. The purpose of the meeting is to make initial contact between those interested in developing on the XO platform and to start working on some interesting applications. To do so, we are going to host some introductory talks and workshops, and then organize in small teams focused on specific development goals. In particular, there is an initiative to develop a system to facilitate the creation of blogs from the laptop, which would increase the number of blogs authored in schools throughout the country. “Jam!” meetings take place throughout much of the first world and consist of gathering people with common interests to work intensively to create something together. Its origin comes from jazz groups, which conducted improvisational “Jam sessions,” usually after a concert. It is a new mdoel in our country, but we hope that is not the last meeting of this kind.